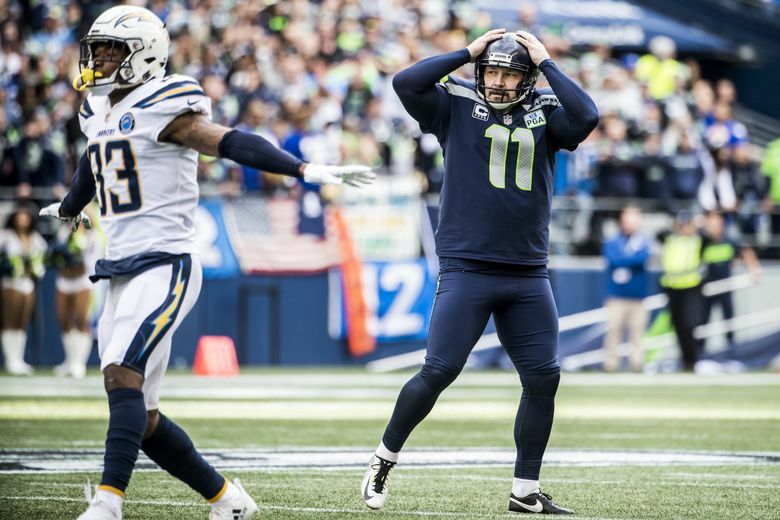 The Seahawks fell to 4-4 with a tough defeat to the Chargers that Seattle figures to lament for the rest of the season. Here’s my weekly review of what I thought might happen in the Seahawks’ game and what actually did, a brutal 25-17 loss that is going to make for an especially tough road to get to the playoffs. WHAT I SAID: Chargers QB Philip Rivers against the Seahawks’ pass rush. WHAT HAPPENED: Rivers was sacked twice, and after a hot start was kept relatively in check down the stretch as Los Angeles’ offense was held scoreless in the second half. Conversely, the Chargers also seemed content to sit on what was always at least a two-possession lead until the final 1:50. It could have been worse — the Chargers were held to 215 total passing yards, significantly less than their 278 average coming in, which ranked 10th in the NFL. But the Chargers made the plays they needed to win. WHAT I SAID: Safety Bradley McDougald. WHAT HAPPENED: McDougald played just 27 of a possible 51 snaps while battling a knee injury that has bothered him for a few weeks now and will likely be an issue for the next few weeks with Seattle playing Sunday, and then next Thursday. McDougald did not have a tackle, with the knee undoubtedly bothering him, and the Seahawks seemed to play better on defense in the second half with Delano Hill at strong safety. WHAT I COULD HAVE SAID: QB Russell Wilson. 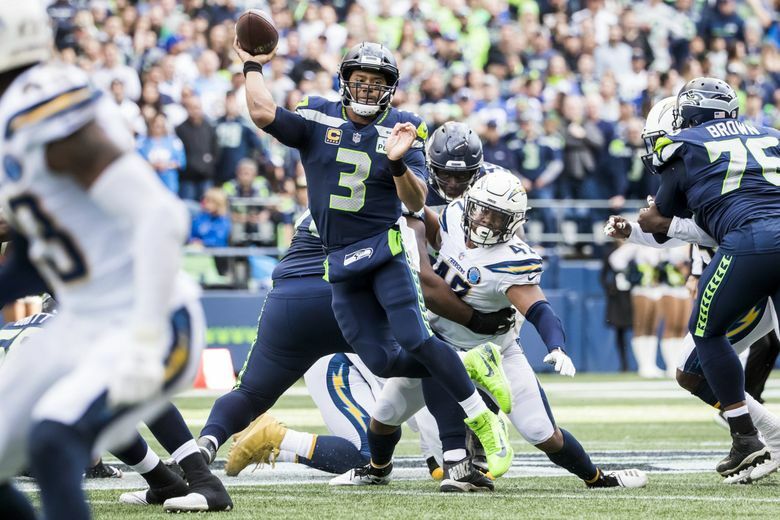 A week after turning in a perfect passer rating, Wilson struggled, throwing a pick-six, getting sacked four times — Carroll said he could have avoided all of them — and missing a few throws to open receivers. Still, Wilson almost led Seattle all the way back — the final throw would have gone down in Wilson lore if it hadn’t been tipped. Unfortunately, David Moore was just not able to reel it in. Given how good Wilson has been overall throughout his Seattle career there can be a danger in expecting too much — as Carroll noted on his radio show Monday. Conversely, Wilson is among the most highly paid QBs in the NFL for a reason — the team expects him to be consistently good. But in reality, Seattle doesn’t have the margin for error around Wilson as it did earlier in his career to win when he doesn’t play well. WHAT I SAID: Will the Seahawks stick with the run if they fall behind? WHAT I COULD HAVE SAID: Will the Seahawks try to keep attacking with deep passes? WHAT I SAID: Receiver Doug Baldwin. WHAT HAPPENED: One of the more positive signs of Sunday’s game was the play of Baldwin, who had four receptions on four targets for 77 yards, and a 12-yarder that was called back, and by Carroll’s estimation, he was open at least one other time for what could have been a big gain. Seattle will need all that it can get from Baldwin going forward. WHAT I COULD HAVE SAID: Special teams. Had Seattle somehow won this game it would have pointed to special teams as a big reason why. True, Sebastian Janikowski missed a field goal. But Michael Dickson’s punting (50-yard average net) gave Seattle a huge field-position edge much of the day, and Chargers kicker Caleb Sturgis missed two PATs and a 42-yard field goal. It was the latest in a string of shaky performances that proved to be the final straw for the Chargers, who waived Sturgis on Monday. Seattle also allowed just 22 yards on two kickoff returns. The Chargers began seven of their 10 possessions inside their own 24, and six inside their own 17. WHAT I SAID: Defensive end Dion Jordan. WHAT HAPPENED: Jordan played 26 snaps in his second straight game, seeing significant action after missing two of the previous three games due to injury. Jordan had two tackles but no sacks or QB hits, and Seattle will need more pass rush help from him going forward. Jordan doesn’t have a sack yet this season and just two QB hits. WHAT I COULD HAVE SAID: Safety Delano Hill. Maybe we should have known Hill might have to play some given McDougald’s questionable status entering the game due to his knee issue. Hill, a second-year player out of Michigan and a third-round pick in 2017, had played just 33 snaps on defense before Sunday. But he played a career-high 25 against the Chargers and held up well, making four tackles, one for a loss, playing throughout a second half when the Seattle defense stiffened considerably. Los Angeles punted on four of its five second-half drives the other resulting in a missed field goal. WHAT HAPPENED: Well, like the Seahawks, I am now 4-4 on the season with my picks of their games. But if it seems like it’s hard to get a read on the Seahawks maybe what’s really at play more than inconsistency is simply what happens when Seattle steps up in competition. The four teams Seattle has beaten this season are now 9-23, none holding a record better than the Cowboys at 3-4, while the four teams Seattle has lost to are 22-12, three with winning records.